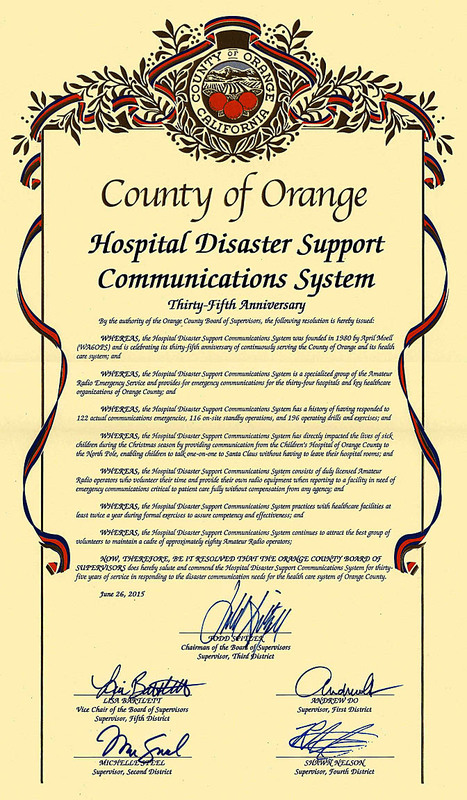 The Hospital Disaster Support Communications System (HDSCS) is a group of Amateur Radio ("ham") operators who have volunteered to provide backup internal and external communications for critical medical facilities in Orange County, California whenever normal communications are interrupted for any reason. In 2018, HDSCS celebrated its 38th year of service. It has been thirty-nine years since I found myself, radio-in-hand at the switchboard of the hospital where I worked, asking the operators what had happened to the phone system. During the next two hours, after my call on a local repeater, several operators with various levels of preparation showed up at my hospital to help. Within a year, after an inquiry by the hospital disaster chairperson and an invitation to participate during one of the hospital's required disaster drills, I had helped to forge a specialty ARES group, the Hospital Disaster Support Communications System. Over the next 38 years, as many as 36 hospitals would ask HDSCS to be included in their disaster plans and there would be over 120 times that our volunteer group would be activated to support hospitals with communications failures. The members who responded in all those instances did so on a voluntary basis and provided their own equipment, often at inconvenient times. There were lots of drills and standby operations along the way, too. But now it is time to step down and make a clean break. Keeping the group operational, at the level that is necessary and desirable, has become unrealistic for me due to medical issues that I have been dealing with for several years. While HDSCS members have been dedicated and capable, none has the available time, the requisite experience and the continuing interest to manage a group of Amateur Radio operators under the HDSCS model that has been developed and refined over the years. Therefore, a succession plan has proven to be impossible and there is no gradual way to discontinue HDSCS activity. So at this time, HDSCS is disbanded. It has been an honor to lead such an incredible group of dedicated volunteer Amateur Radio Operators and to have my hobby become part of my county hospitals' disaster plans. Even though HDSCS may not continue, our friendships can. I look forward to seeing and talking to you in our other Amateur Radio activities. I encourage all of you to offer your time and skills to public service groups or events that may have the need. Current HDSCS members should check the MEMBERS ONLY section of this Web site for information about disposition of identification cards and return of county-owned blue vests. We believe that the HDSCS model under the Amateur Radio Emergency Service (ARES) is the most effective way to perform hospital support. Those interested in continuing Amateur Radio service to Orange County medical facilities should contact Bob Turner W6RHK, the Section Emergency Coordinator for the Orange Section of the American Radio Relay League (w6rhk@yahoo.com). Any other inquiries about the disbanding of HDSCS should be directed to former Assistant Coordinator Joe Moell K0OV (k0ov@hdscs.org). To the hospital disaster planners and Emergency Medical Services Agency personnel who have worked with us to plan and provide Amateur Radio backup communications, please accept our deep appreciation. "Core Team" response to hospitals after earthquakes, etc. In addition to kudos from our supported hospitals and Orange County Emergency Medical Services, HDSCS and its members have received recognition from legislators at the county, state and national level. Entire site Copyright ©1998-2018 Joseph and April Moell. Republication of any content without prior permission is prohibited. Hospital Disaster Communication logo ©1984. All rights reserved. ARES® is a registered Service Mark of the American Radio Relay League, used by permission.